Endings. They’re the new beginnings, folks. And while December can feel like the calendar equivalent of a French waiters’ trick where everything’s whipped off the table before you were sure that you’d finished, it can also be the perfect time to combine contemplation and celebration with the launch of something new. An opportunity to look beyond the craziness of the silly season, and turn your focus to the calm, blank canvas of the future and all the potential it holds. That’s the way we’re choosing to roll, here at Community Music Victoria. Like buses, there hasn’t been a new CMVic publication for aaaages, and over the past week, two have come along at once. Whether you’re a Singing Leader or somebody who simply loves to sing, the new song book from Community Music Victoria, Sing it – Songs of Wisdom Hope and Laughter, together with ‘A Guide to Community Singing Leadership’ hold within their respective covers enough new material, advice and guidance to ensure 2016 is both an inspired and inspiring year, packed with new tunes and songs to discover, and fresh methodologies to adopt and incorporate into your leadership practise. Both of the books were sung into being at a CMVic celebration held last weekend. Beneath the bunting in Ross House, the fairy lights were unravelled, paper plates piled perilously high were passed around, and CMVic members, coordinators and volunteers gathered together to celebrate the double launch. Each of the books has a place close to everyone’s hearts and has been in the pipeline for a number of years, so it was just incredible and also a relief to see them both fresh back from the publishers and dressed to party in their shiny dust jackets, finally sharing a table and their moment in the spotlight. The final selection of 45 songs in Sing it was edited and arranged by Jane Thompson and James Rigby with Fay White sorting out the vital scaffolding of contracts and copyright, while a large amount of work was undertaken to get the project underway in the initial phase, by Corinna Peachey. Written in the main by community singing leaders for community singing groups, the gorgeous variety and quality of the songs will no doubt put wind in the sails of many singing groups in Victoria, across Australia and beyond, with the songs breezing through the wattles and into the wide world over the course of 2016 and for many years to come. Suzanne Petersen’s song, ‘Walk away from your trouble’ has more words than those published in the book. To enjoy the song in its full extent, download the lyrics here. “A few years ago (yes, things move slowly!) I was working through Julia Cameron’s ‘The Vein of Gold – A Journey into Your Creative Heart’. I’d been feeling inspired to write, and knew I wanted to write something, but didn’t know what. At that stage, I’d been running choirs as my full time business for a few years. I wasn’t an expert by any means, but I had a good grounding in the practice that had been guided and supported by Community Music Victoria. I wrote wildly for a few days straight, forming the structure of the book and a lot of the content. I knew the book could not be mine alone and wanted it to reflect the myriad of voices and collective wisdom of our singing leader community. I read every edition of Shout! and Sing It! that I had access to, and requested permission to re-publish many of the articles that fit within the scope of the chapters. People were generously willing to share their work in this format and so it began to come together. Over the years, there were chunks of time where I got caught up in life and totally dropped the project. There were also times where my own doubt stopped me from taking the next step… making that phone call, re-reading that draft. But somehow it continued, and somehow we’ve now reached the point of publishing and release! You can buy either (or both!) 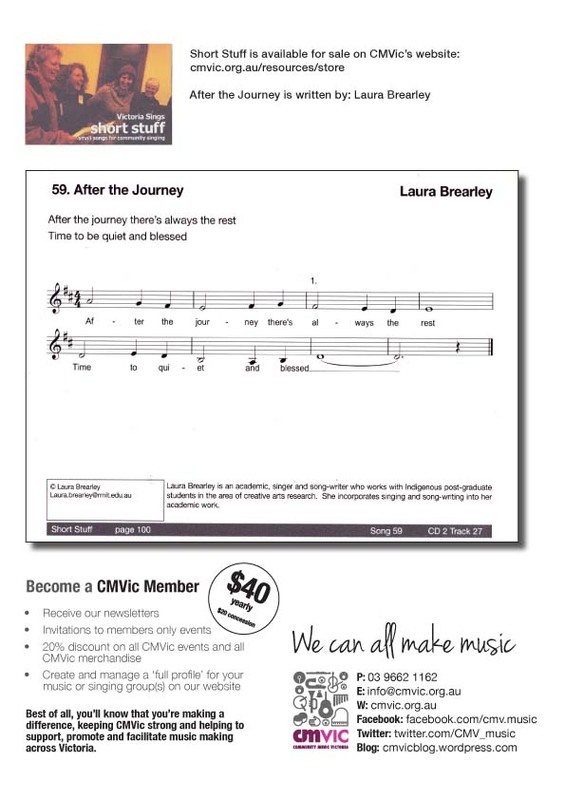 A Guide to Community Singing Leadership and Sing it – Songs of Wisdom, Hope and Harmony, from the store section of the CMVic website. Please be aware that orders placed after December 16 may take a little while to reach you as CMVic HQ is shutting down for the holidays, but reach you, they will. And finally, with endings and fresh starts still very much in mind, huge amounts of gratitude and our very best wishes go to three very special people. To Jane Coker who is changing hats after doing an outstanding job as CMVic’s Victoria Sings coordinator for the past fourteen years; to Aaron Silver who is moving out of Melbourne and swapping his role of Engaging Younger People for Teaching younger people; and to Heather McLaughlin, long time CMVic board member, community music champion and marimba queen, who is moving interstate. Our love to you all! This is the final blog post for 2015. Thank you, lovely people, for reading and commenting on the the past twelve months’ posts and please continue to share your stories and experiences of music making in your communities with us next year, you know we love to hear them. Wishing you all much music making and merriment as well as good health and happiness for 2016. See you on the other side! The Dandenong hills are alive with the sound of music but there’s no sign of the Von Trapps in any of the tea shops, anyone running is probably just late for Puffing Billy not making a dash for the Swiss border, and for lonely goatherds there are open mic nights and online forums. How times have changed… Much of the music ringing around these green hills is community music, championed and facilitated by, among others, Barb McFarlane, a long time community music activist and valued supporter of Community Music Victoria. Ooh, now who doesn’t love a bit of positive feedback? It spreads happiness and comfort like butter on hot toast. So, getting a little greedy, we pursued Barb shamelessly with questions about her style and approach to singing leadership that she was good enough to answer with further reflection on why she loves Song Swaps so much, as well as offering some insight into her own musical journey, which began at a young age. So what was it that made Barb decide to become a Singing Leader? I realised that I didn’t get much pleasure out of performing and was embarrassed by praise. I felt there was something I was missing, a realisation about the thoughts and feelings that audience members had, that seemed to make them think they couldn’t do what I was doing. It bothered me that over the years, people said things that seemed to put performers above themselves. It was like finding gold when I realised that I could help empower people to sing without judgment and with no audience but the circle of other singers. Barb leads two weekly Sing for Fun groups that are inclusive of people of all abilities, a Strum and Sing Ukulele group and a Community Choir called VoKallista, which she started in 2009 and runs with assistance from Libby Price. Vokallista is an open, performing choir who sing a variety of material that Barb describes as dealing with themes such as social justice “and the fascinating challenges of being human.” She leads sings at many community events and festivals such as The Hills and finds that people really love to celebrate! VoKallista has been going for a while now; how do you keep it evolving and what do you think is the secret of its success? VoKallista evolved from a caroling group I was leading. We’d all troup around nursing homes and the like in the busy lead-up to Christmas, instead of being swallowed up by the craziness. I think the kind of people we are has led the style and subjects of music and then we’ve attracted more people who like our songs and are similarly community minded, like to live more simply, are very caring of the environment and keen on social justice, peace and equality among human beings. So maybe the ‘secret’ has been that ‘like attracts like’! Having an Assistant Director in Libby Price has been invaluable. I’ve had someone to talk through difficult stuff with, as well as lots of the practical things running a choir calls for. I credit the circle formation that I’ve learned to work in, with much of the success of the model of Sing for Fun, otherwise known as Vocal Nosh. (I don’t do food!) Without words each participant is saying “you are welcome, you are one of us, you have value as a person, we are all equal, we are on the same team, however you are today is fine, I can see you, I can hear you and let’s create something beautiful together.” CMVic have given this amazing gift to the community by teaching this model to all Singing Leaders who have come to them and taken this back into their communities. Working in a circle is, for me, the most important element to the success of any singing group but so many of the basic singing leadership skills have become my second language as I see how easy they make the learning of a song for people. CMVic has been Mothership to me and I have developed further skills and confidence to lead a group in song. I receive such wonderful support and encouragement from CMVic to continue to skill share and song share with other leaders and this keeps my practice very fresh and keeps me inspired and energised! CMVic members are like my musical family. What is it about short songs that makes them so effective to teach a group? The thing about these songs is that they are easily passed on….to other Leaders to use and then to groups of people who may be singing for the first time in their adult life or who have not had many opportunities to sing. The song messages are often very nurturing, reassuring and inspiring and, because they are usually repeated many times and because some are rounds, we tend to go away with the songs stuck in our heads. This can sometimes override other less helpful stuff that may be going on in our heads! I love ear worms! Do you think more people are turning to community music making in greater numbers as a way of reaching out and connecting with one another? Oh Yes!! I love to see the friendships and connections that are made through a regular sing for fun. I love to hear people’s stories and know that they have found a place to be where whatever they sound like is fine, where there is lots of non-verbal communication through laughter and grimaces, little teams clinging together to stay on their part, eye rolling as my ‘secretary’ is once again sacked for a funny typo. I choose songs that will encourage a positive thought or two, funny songs and songs that are beautiful with just two parts so that people may feel that they are the creators. I reckon that all times have their difficulties but the time we live in now calls for strengthened, tightly woven communities who will be able to pull together when needed. What do you like to do when you’re not singing and music making? I read a lot. I love a good chat and a walk in the forest. I also get involved in Community events. Finally, if you were let loose in one of the many tasty cake shops nestled in those hills, which tasty treat would be in the most danger? Lemon Meringue pie! 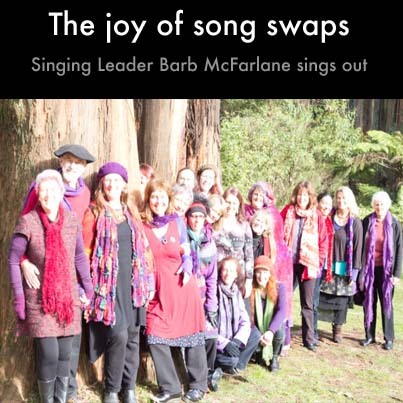 Barb’s community choir have struck lucky in having her as their leader, something they’re probably highly aware of as they continue to try and determine the human condition and sing to bring awareness, change and enrichment to the lives of themselves and of others. Huge thanks to Barb for playing ball and giving her time and energy to this post. The song ‘After the journey’ is published here, courtesy of Laura Brearley and is taken from the CMVic publication ‘Short Stuff’.